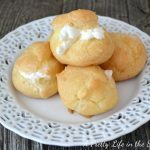 Don’t be afraid to make Cream Puffs! These little treats are so easy to make and taste as good, if not better than store bought ones. After they have cooled completely you can put the filling of your choice. For these I just forced a tip and piped in whipped cream. Then I froze ours because we love the cream puffs at Costco that you eat slightly frozen. Remove from heat, and add 1 egg. Beat. Let stand for 5 minutes. Add the remaining eggs 1 at a time, and beat after each addition. You can drop with a spoon OR put the dough into a ziplock bag, snip the corner off, and pipe the dough on to the cookie sheet. This is the method I chose! Use a heaping tbsp for each puff. (See picture below.) Make sure they are about 2 inches apart. Bake for 20-30 minutes, depending on your oven. Start checking them around 20 minutes. Mine took 30 minutes. There are so many possibilities for delicious fillings! Vanilla Cream, Custard, Coconut Cream, Lemon Cream, Chocolate Cream, Strawberry Cream. So many possibilities!